You’re going to love this one, it’s my new favorite meal – you’ll love it and your kids will too! All the deliciousness of your favorite cheese burger without the bun! 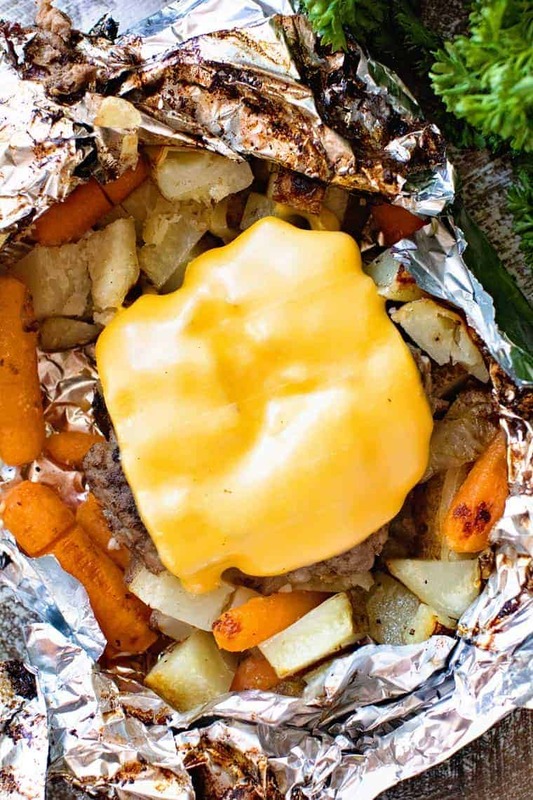 What’s not to love about a juicy cheeseburger, potatoes and carrots all grilled in a foil pack. It’s such an easy dinner idea with minimal clean up! 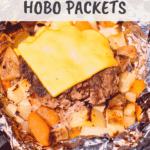 Never heard of a Hobo Packet? 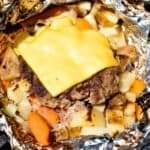 This is a simple recipe that combines beef and all your favorite seasonings with potatoes and carrots in a simple packet that can be either grilled or even baked in the oven! It’s easy and so good! How do you make foil packets? Combine the ingredients for the hamburger and form the patties, set aside. Then combine the remaining ingredients, except the cheese. 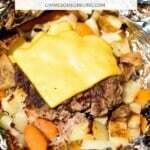 Place 1/4 of the veggies in the center of the foil, top with a beef patty, seal the packet. Repeat with the remaining three. Place beef side up on the grill. Open and add the cheese at the end. Reseal and grill for just a moment more until the cheese is all melty! It only takes 35-45 minutes for the beef to cook and the vegetables get tender. The seasoning on the beef oozes right into the vegetables making them so flavorful! Can’t get your kids to eat their veggies? That ends right here! 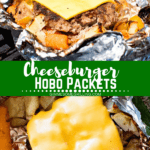 How long do you cook hobo packets in the oven? If you’re not in the mood to break out the grill, this is a great meal to make in the oven also. It only takes about 45 minutes to bake – just cook until the beef reaches an internal temp of 160 degrees. Everything else you’ll grab from your fridge and pantry! 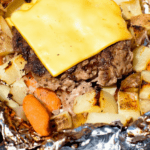 Here are more foil packet recipes to check out! Bacon Ranch Chicken Packets – cooked with ranch flavored butter and melty cheese? Oh yes! Tater Tot Meatball Foil Packets – love how simple this one is! Corn on the Cob in Foil – easy and delicious, it’s the perfect side dish! and for dessert…. Apple Pie Packets – made, you guessed it right on the grill in it’s own individual packet. 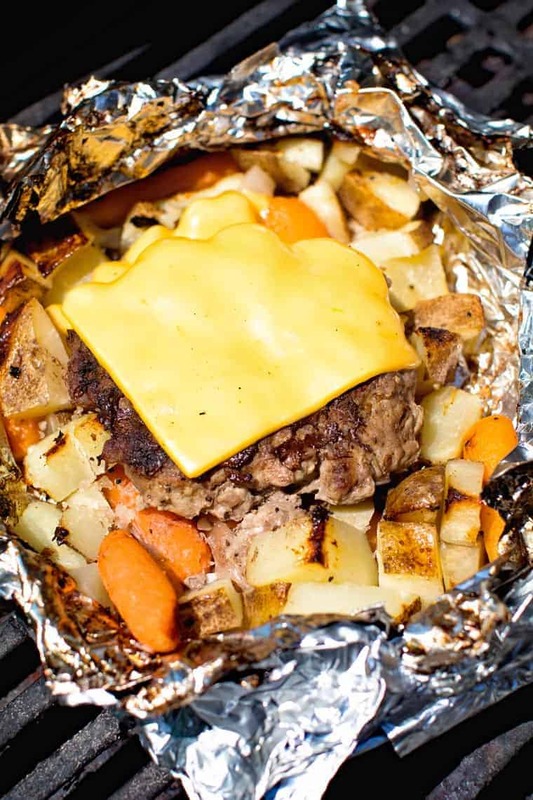 An entire meal, wrapped in foil and made on the grill! Already portioned – easy peasy! And you know what the great bonus is? Clean-up is a breeze! 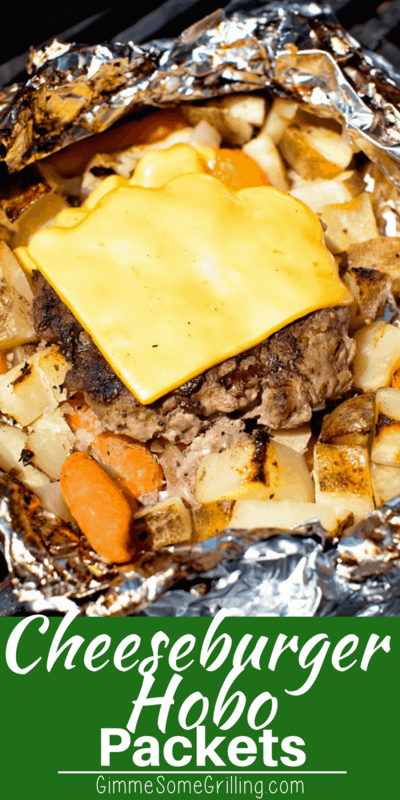 Remember foil packets can be made on the grill or campfire and even in the oven! If you’re cooking it in the oven you can substitute parchment paper for the foil in a pinch. 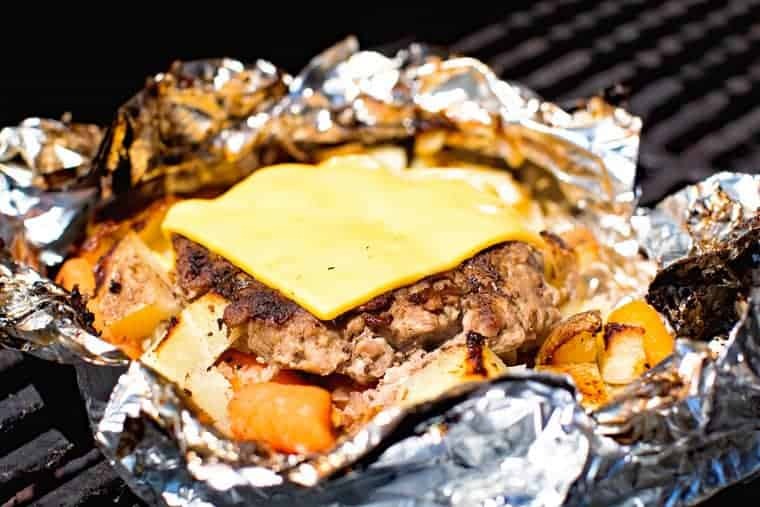 Tip – purchase heavy duty aluminum foil when you’re using it on the grill or campfire or double it up so there are two layers. This will keep the bottom from getting burnt! What is your favorite foil packet on the the grill? If you have tried this recipe be sure and leave a comment below, I’d love to hear from you! If you snap a picture, be sure to tag me on Instagram @GimmeSomeGrilling! In a bowl combine the hamburger, egg, seasoning salt and garlic powder. Form into four patties, set aside. In a large bowl combine the remaining ingredients except cheese slices. Mix until combined. Spray four 12'' x18'' pieces of foil with nonstick spray. Place 1/4 of the vegetables in the center of the foil. Top with 1 beef patty. Seal packets and place beef side up on the grill. Grill for 35-45 minutes or until potatoes and carrots are tender and the ground beef reaches 160 degrees F. I flipped mine over during the last 20 minutes of cooking. When the packets are done open the top, hamburger patty facing up, and add a piece of cheese. Close grill cover and grill 2-3 minutes or until cheese is melted. These can also be made in the oven. Simple preheat oven to 350 degrees. Place the foil packets, beef side up on a large baking sheet and bake 45 minutes or until vegetables are tender and the ground beef reaches an internal temperature of 160 degrees F.
Was delish. Skipped the cheese part but added som garlic cloves and additional spices to the packet. Was great. Hi there! I figured out how many pieces of aluminum foil to cut but I just thought I’d let you know that info is not down in the printable recipe part which is how most people use these recipes. They’re in the oven now and my husband is salivating at the smell!